So we’ve covered how expensive it is to eat on the slopes of Bansko, but now the question is whether it’s the same in the town itself. Bansko has so many restaurants, that it’s almost impossible to visit them all in one trip (not that you would want to go to every single one), so we’ve put together a list of great restaurants that you can check out. To build this list and be as unbiased as possible we will mix our own opinions with those of tourists, who have taken the time to rate visited restaurants in TripAdvisor. We will also be judging the restaurants based on price, location, menu diversity, service, atmosphere and quality of the food. We visited each of them to make sure they are just as good as the reviews in TripAdvisor* make them out to be. 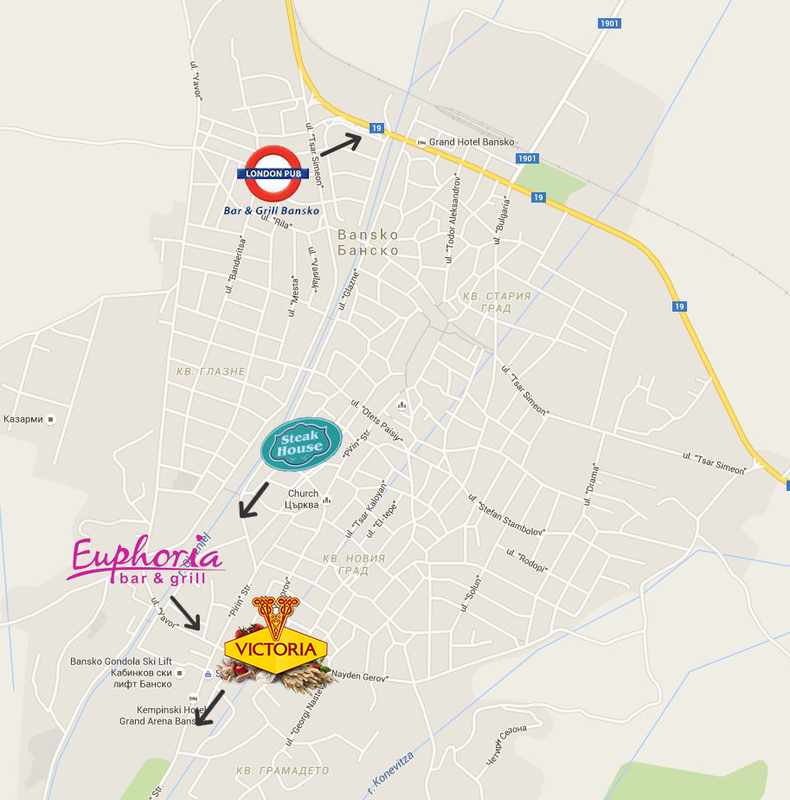 One of my favorite restaurants in Bansko is the Euphoria Bar & Grill. Located next to the gondola and Ski & Board Traventuria rental shop, it has a very big variety of food, good staff and plenty of space to sit and eat outside. It is very well suited for big groups as well as single families. They also offer pizza slices that you can order on the go, if you just want a quick bite to eat. It’s also very big, with lots of places to sit, so chances of not getting seated immediately are lower than some of the other places on this list. There is also a great outdoor terrace with a view of the mountains. Location – Less than 200 meters away from the bottom gondola station. A little far from the city center, but a great option to test on your way back from the slopes. Menu – Pizza, fish, pasta, Chinese food, Bulgarian cuisine and a good grill. Now if that ain’t a diverse menu, I don’t know what is. Atmosphere – Lighting is a little dimmer than some of the other places on this list, but this gives it a more party atmosphere. There is also a live band that plays there. It can get loud, so it may not be the best place to eat if you’re looking for something quite. This place also has more TV screens than an electronics store. 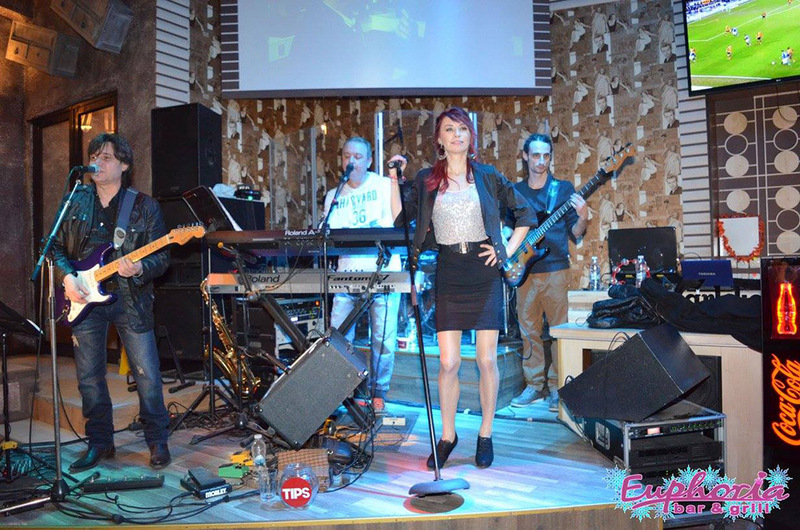 Plenty of great live music in Euphoria. Food – Excellent, just excellent. The head chef is one of the best in Bansko and does an outstanding job. Price – On the more expensive side of things compared to the cheaper restaurants in Bansko, but quality never comes cheap. Well worth it. The Victoria Restaurant is one of the most famous pizza places in Bulgaria and has quite a few restaurants in Sofia, the Bulgarian capital. A while back they also opened a restaurant in Bansko which is the best place for pizza here. Each pizza is made with the best ingredients and in a traditional pizza oven, which makes it that much better. The menu has a wide selection of pizzas, pastas, grilled meat and more. One of the things I like most about this restaurant is the free delivery they offer in Bansko. A word of advice, make a reservation! The restaurant itself is too small for the amount of people that want to eat there and chances of having to wait are big in high season and weekends. Location – It’s located relatively close the the bottom gondola station, a little bit further up the road in the direction of hotel Kempinski. It’s located in the building of the Uniqato Boutique hotel and the entrance is the same. Menu – The menu consists of anything your normal pizza parlor would offer, but the pizza is the gem of this restaurant. You can check out their menu online on their website, just make sure to select Bansko, as the menu is different than the one for Sofia. Pizzas come in small, big and family sizes. I generally go for a small pizza and something else, as the big ones are a little too much for just one person. Atmosphere – The entrance of the restaurant is very impressive and gives you a sense of luxury before even entering. The restaurant is well lighted and isn’t dim like some of the other places on this list. It’s definitely orientated for people looking for a nice dinner with less distractions. Not the best choice if you’re looking for a place to sit and drink beers 5 hours, but great for a quick dinner before going to the bar. Food – Pizza, pizza, pizza. I love pizza and if you do too, then this should be your first stop. Warning: Don’t stuff yourself with pepperoni pizzas, as the spiciness can get to you (personal experience). Price – Pricing is very good, considering the prices in other places in Bansko. If you’re ordering online to your hotel, make sure you select Bansko (rather than Sofia) on their website, as prices are higher in Bansko. This is definitely a BIG minus for me, as I always forget to switch cities when ordering online and get a bigger bill. The London Pub is definitely a pleasant surprise for anyone who decides to check it out. The owners are extremely friendly and it’s not out of the ordinary for them to invite you and your group to play some fun games. They also have a children’s corner and a karaoke machine. Honestly, I’d pass at the thought of listing to drunk people singing “Highway to Hell”, but judging by a lot of the reviews on TripAdvisor, most of the time it seems to be quiet and not so full. Location – The pub itself is located on the other side of Bansko from the gondola, next to the town entrance (see map below). This is a big minus, but don’t worry. The owners have a great solution! Free pick up and drop off for the whole Bansko area with a camper (motor home). Menu – Pub grub, as one of the reviews described it. The menu isn’t very big, apart from a wide selection of burgers. They also have a 24 hour per order menu, which is worth checking out. 400g of T-Bone Steak. Getting hungry just looking at it. Food – Burgers and steaks are the main feature here. That and a good selection of beers. Price – Pricing is good for the quality you get. I pass by this place almost every time I go skiing, but didn’t go inside until the time came to write this review. Honestly, I’m very pushed off by the PR guys that stand in front of restaurants, trying to convince you to take a seat, but hey, that’s just my personal opinion. If I were him, I would just hold a sign saying “#7 on TripAdvisor” and just say “Over 100 5**** ratings, they can’t all be fake”. The staff also speaks English very well and are extremely friendly. Service is also pretty fast. Location – It’s location is actually pretty good for them. You can find it by going down the street from hotel Strazhite and taking a left at the cross road where the Lion’s Pub is. It’s right on the main road that is parallel to the river. If you’re walking on the left side, you will be stopped by the PR guy, so no chance in missing it. Menu – The menu is perfect if you’re in the mood for beers with your food. Nothing goes down better with a beer than steaks and Mexican food and they have some nice starters. Atmosphere – It has an old western atmosphere. The place is packed with tables that can be moved around to make space for bigger groups. The lighting is on the dimmer side, which is good, much more relaxing than in the Victoria. It has a big fireplace and anything that can be made from wood is. Even the lights look like their out of an old western movie. Food -If your a group of 3-4 people, I would suggest getting a portion of nachos to start with. 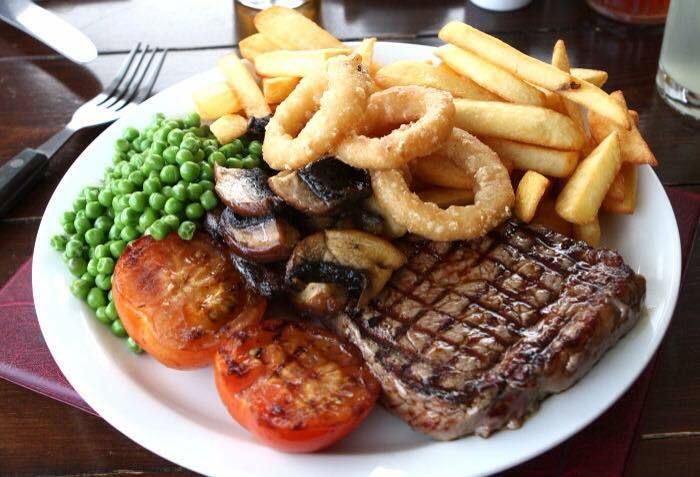 Followed by steaks, definitely steaks. The Mexican food looked great on the table next to us. Price – In the mid-range, cheaper than some of the other places on this list. There are plenty more great Bansko restaurants, just in TripAdvisor there are over 90. So we highly encourages doing your own exploration. If you think we missed out or forgot to mention any great restaurants, let us know in the comments section below. For more info on Bansko, download our FREE guide. Click HERE.